I first ran in Death Valley in February ’06 in the Death Valley marathon. That year the Titus Canyon road was closed and we ran out and back on West Side Road. It was the first time I’d traveled to a race. The temperature got into the 80’s. I wasn’t prepared for that. I lost my S-caps right away. I didn’t eat much at all. My legs were locking up from cramps the last couple miles. At the end, as we milled around, another runner came over and asked with concern if I was OK. His girlfriend was embarrassed and pulled him away. He was right, however. I was hot and exhausted, not thinking really clearly. Since then, I’ve learned a whole lot. I came back and ran the marathon again in’08. This time it was on the much tougher and scenic Titus Canyon route. I did much better that year and began to love Death Valley. I began to run longer and more difficult courses. The toughest race was Massanutten in ’08. I was 34 ½ hours finishing that 100 miles. I ran 4 100’s in 2008. I applied to Badwater in January ’09 like many other runners. I know I’m not an elite runner by any stretch. I made back up plans for a solo run the week after the official race. I made stay reservations for both the big dance and a solo party. When the email came from the selection committee came, I opened it with trepidation. I re-read it several times in the next couple of days to be sure it was real. I had prepared a crew. Denny would be crew chief. He works for the county emergency services He has been a firefighter and ambulance attendant. He is thorough and is an organizer. My son Mike is an engineer. He too is organized and logical. He is a passionate skier and cyclist. He has done several 100 mile bike rides. My daughter Melinda lives in California. I wanted to make this a family event, so she and her boyfriend Mike were in. My ex-wife rounded out the family. Her nurse skills might come in handy. We needed one more and were able to find Niki from the Badwater blog crew postings. Niki is a climber and mountaineer, spending time in the mountains all over the world. She is also a cyclist, having covered 200 miles in a 24 hour period. Mike and Denny had crewed for me before, in Vermont and at Iroquois in New York. The best chance for more crew training came in May at the Keys 100. Mike, Denny, Ron and I flew to Florida. We picked up a rental van and set it up just like we would for Badwater. Keys is a point to point run on a paved road, just like Badwater. It is a great practice event. Several others were practicing there too. A bit later, my thighs started to feel a bit sore. I started to take walking breaks, then more. I ended up walking the last 30 miles. I was making 15 minute miles, so I didn’t lose any place because of it. I finished in 25:05 much wiser and with an experienced crew. We flew into Las Vegas Thursday. We picked up our rental van, making sure to get one with two keys. Getting locked out of the car is a disaster we didn’t want. We stocked up in a big store and finished the list in Pahrump. We stopped at Dante’s View so the crew could get a look at the valley. It is stunning and the scope of Death Valley and the task ahead became real. After supper that evening, we stepped out to a hot evening with a hair dryer wind. That was the only time I felt any concern about the weather. Sunday went by quickly with runner check in and the pre-race meeting. We turned in early and I slept well. We were up at 4:15, nervously quiet. Once we got to Badwater, I felt calm. The point called Badwater is a parking area where the race was to begin. I weighed in, got lots of pictures taken and waited. Even at line up, I was calm. Thalia Kostman, daughter of the race director, sang the national anthem, very moving, in her beautiful voice. At GO, I moved out with everybody else, intending to stay in the last half of the group. I didn’t have a real strategy, just to remain steady. I had told the crew to keep me under 12 minute miles. I knew the first 42 miles were the key to the race. I walked the upslopes and ran the flat and downhill parts. I found myself running with Frank McKinney from Florida. 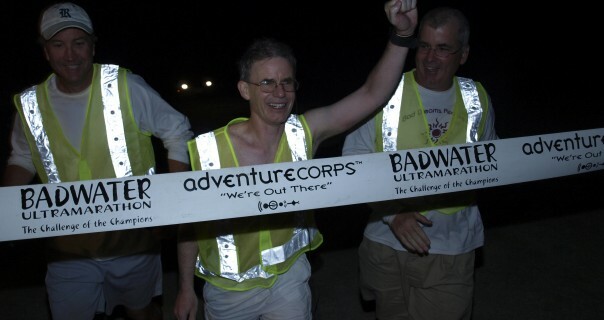 This was his 4th Badwater. Our pace was well matched and I saw him many more times. We were in the shade of the mountains till around 9:30, when the sun rose above them. I was running easy, looking at the desert scenery, still not sure it was real. After the Furnace Creek check in, I felt the day warm up. I had done my sauna training, so I was as ready as I could get. The crew started spraying me with water and making ice bandanas for my neck. At Stovepipe Wells, I sat on the shaded porch with my feet up. I ate ice cream and rested. I was videotaped by somebody. The walk up Towne Pass is where I got the first company. Mike got out and paced me here. We began to get passed by the faster runners that had started later. There are 3 starting waves, with the elite runners assigned to the later starts. I remembered last year when we were at the Emigrant Canyon turn off, we were told that the course route had been changed due to flash flooding ahead. We got another rain shower right there just like last time too, only no rainbow this time. I continued to run and walk easily, not feeling any pressure. I came in with a goal of finishing. I really wanted a buckle for finishing in 48 hours or less. During a burst of optimism I had made up a chart showing a 44 hour finish. I was feeling good and ahead of even that. It got dark as we neared the top of the pass. Niki took a picture of us at the sign on the summit. I ran most of the long downhill to Panimint Springs. There was a crew shift change a few miles outside Panimint. Frank McKinney caught up to me as I ate by the van. He intended a break at Panimint as I did. Jack Denness was running the checkpoint at Panimint. He showed me the cottage set aside for runners. I was able to get a shower, but the bunks were full. My prepared crew laid out a pad for me and I was able to nap just off the parking lot. They let me sleep an hour and a half. I felt good and finished a huge strawberry smoothie they had ready for me when I woke. There must have been 1,000 calories in the thing. I saw Frank’s crew van on the road as we left, he must have been right behind me. Denny took over pacing up to Father Crowley Point. This long uphill is dreaded by most of the runners. It is 8 miles long, narrow and with few good places for the van to park. Daylight arrived as we moved along. I felt good, felt strong. After the top, Melinda took over for some pacing duties. It was great to move along and talk and enjoy the sights. There is a long downhill stretch past the Darwin turnoff. I ran the whole thing, 7 miles or so. I ran through the Darwin checkpoint, calling out my race number, 83. For a portion of this I was doing 9 minute miles. Really flying for me. Especially with 24 hours done and almost 100 miles. At the end of the downhill, I sat down at the van and ate and rested a bit. My plan was to walk the long flat past Keeler. We did get pictures at the 100 mile mark. Right around there, we got a couple F15 flyovers. Around the 115 mile mark, Kelvin Marshall’s crew pulled up behind us. I had crewed for Kelvin last year. This year, he wanted to better his time of 40:20. He hoped to beat the previous time set by another Australian runner. He did so with a 36:30 finish. In a few minutes, Kelvin blasted by me with Steve Ochoa in tow. Soon it was crew change time again. Niki stepped in to pace. Mike and Mike were the van guys for now. Niki was a good pacer, talking when I wanted to talk, quiet when I was. I got a bit behind in taking in calories around this point. Mike B had come prepared with some MREs. He had a backpacking stove and made me an omelet with turkey and cheese, followed with hot tea. That hit the spot and gave me the boost I needed. Most runners find the Owens Lake stretch boring and hate that part. I didn’t find it so bad. It took me a while to figure out what I was seeing cross the lake. It looked like a parade of Loch Ness monsters. There was a head and tail and humps in between, black in color and reflecting in the lake. As we got to the lower end of the lake and they got closer to the road, I could see that they were truck tractors pulling two trailers of rock. I don’t know what they were doing, but there was a parade of rock trucks going somewhere. This seemed the hottest part of the course. Denny’s weather instrument only registered 115. It had been 120 the day before. Maybe the fatigue had something to do with it. I was still moving well with a steady walk. The crew kept spraying and bandanaing. Nothing sounded good to eat and I got behind on calories again. I looked forward to a burger and fries in Lone Pine. I kept underestimating the distance left. By the time we turned onto Route 190, I was way behind the curve, into a bonk. I was tired and a bit cranky. I thought I remembered the walk to the Portal Road as having shade. There was no relief this time. Niki and I checked in at the Dow Villa time station and finally turned onto the Portal Road. I was really ready for that burger and fries. I had told the crew we would take a break in the first part of the Portal Road. I remembered it as wide and shaded in the first ¼ mile. I sat and put my feet up on the bumper. The food went down well. I was sweaty from the hot walk and when I sat in the shade, I cooled off fast. There was a bit of a breeze and I began to shiver. When I finished eating, I got into the car that had been sitting with the windows up. The warm car felt good, as I was still shivering. I got to doze a half hour. Ron and Denny went back to the Best Western to wait while I went up the last 12 miles. I told them to allow 4 hours. This is the home stretch, so there was no pressure or doubt of finishing. It’s just late in the race and runner and crew are tired. This is the steepest part of the course and everybody walks here. Part way up the road is along a stream, the first fresh water we’d seen anywhere on the course. It got dark for the second time and we put on reflective vests and got our lights out. Way below us we heard a siren. It came closer and then a sheriff’s deputy car came screaming up the hill. A couple minutes later another one followed. The last checkpoint is at a wide spot along the road at mile 131. We recorded a time of exactly 40 hours to there. I ate a bit and moved on toward the finish line. The next mile and a half is the steepest of all the course. I got through that well and turned to the left onto the last switchback. From here, the last 2 1/2 miles are much easier. I felt the cool air and knew we were near the pines. Just as we got around the corner, one of the sheriff deputies came down the hill and told us the campground and the area was being evacuated due to a forest fire. We were to go back down off the mountain. About a minute later, this was confirmed by the race director, Chris Kostman. He told us to stake out and return to our motel. The finish line was closed and our race was over. I didn’t feel let down. I absolutely knew I would finish in 41 hours. That was way beyond my most optimistic hope. The actual finish line wasn’t needed at that point. It would have been only a ceremony. We went back down to our rooms at the Best Western. The crew was all wound up. I was tired but happy with the whole adventure. We talked a while and I got a shower to wash off the stickiness. My feet were in good shape, just swollen. After breakfast the next morning, we unpacked the van and cleaned it. Then we went to see if we could get to the top of the mountain. The Portal road was open, so we went on up to see the official finish line. Many other runners were doing the same, so things were crowded at the top, with runners and the usual hikers and campers. It is such a contrast to run for days through the desert and finish in the cool pine trees with a waterfall rushing nearby. No doubt there is a metaphor there. I got my finisher’s medal from Chris. He must have had some sleep at some time, but he was at all the starts and met every runner at the finish line. His is an endurance event. As we went down the road, there were runners still coming in. We honked and cheered for them. In all, there were 75 finishers of the 88 starters. That makes it a pretty good year. The medical team reported it was quiet for them. It has been a month now and I have no doubt lost a few details. The whole thing went so smoothly, it is hard to imagine what could have been better. I do know I want to go back and do it again. It was due to the crew that it did happen so well. I felt like a circus pony doing my bit while they ran the show. In fact, when I go back again, I may well call us Team Trick Pony.